Keiko Furukura realized as a child that she was different from everyone else. Her classmates and teachers were increasingly dismayed by her behavior and her family desperately wanted her to be “cured” and become “normal.” Until Keiko found her job at the Smile Mart convenience store during university, she felt doomed to be the odd one out. But at Smile Mart, the world makes perfect sense. She can follow the employee behavior manual, mimic the speech and dress of her co-workers, and everyone seems happy with her. 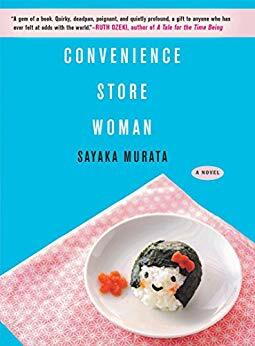 Flash-forward 18 years; working part-time at a convenience store is no longer enough to keep her friends and family satisfied, and Keiko finds that it is time for a change. This story gives some insight into the importance of conformity in Japanese culture; it is more important to Keiko’s friends and family that she meet societal expectations, to get married or find a real career path, than to live a content life as a misfit…even if that marriage is dysfunctional or the career makes her unhappy. Keiko must decide if she will do as others think she should… or be true to herself. A short read, this humorous yet heart-breaking tale may have you wondering who the misfits really are. Murata, Sayaka. Convenience Store Woman. Translated by Ginny Tapley Takemori, Grove Press, 2018. I saw this book on our new shelf recently and of course the cover caught me eye… but I didn’t check it out. I think after your review I’ll have to put it on my to-read list. Thanks!